Ojai is a remarkable place, with a community every bit as rich and diverse as its natural surroundings. Much of the valley is filled with small, family run farms, with the charming and rustic town of Ojai sitting in the valley's center. Known for events such as the Ojai Music Festival and The Ojai Tennis Tournament, and retreats like the Ojai Valley Inn & Spa and Meditation Mount, there is something here for everyone. Ojai Olive Oil is proud to contribute to the area’s diversity, and is the valley’s oldest and largest producer of extra virgin olive oil. Located on the Asquith family ranch, in the east end of the valley, our groves date back over 150 years. Ojai Olive Oil is a true family business, with members of the Asquith family living on the farm and milling each year’s olive oil ever since the company was first founded by Ronald H. Asquith. We take pride in what we do, and in being part of the wonderful community that is Ojai. The Ojai Valley has been regarded as a magical place for thousands of years, in part due to its unique geography. The valley runs perfectly east-west, making it one of only a few such valleys in the world. The result of this orientation is early sunrises and late sunsets, leaving the valley bathed in sunlight all day, and making the hillsides glow with each sunrise and sunset. Ojai is famous for its “Pink Moment”, when the mountains glow pink from the setting sunlight. The valley is also a geomagnetic vortex zone, one of a handful of such locations, like the Giza plateau in Egypt, where the subterranean structure of the earth causes unique energy fields to emerge from the earth's core. One can definitely say that Ojai has more than meets the eye, with its visual splendor being complemented by more subtle wonders as well. Ojai's unique geography and properties, along with its amazing biodiversity, made the valley a sacred place to the Chumash and Oak Grove peoples. These societies made the valley their home for many thousands of years, and their heritage has the region steeped in ancient mystery and native folklore. It would seem that the valley has always been a gathering place for those seeking a more peaceful and harmonious existence. Today it is home to numerous spiritual centers and retreats, and has long been a refuge for many of Los Angeles’ citizens from their hectic lives in the city. Regardless of where you are coming from and what you are seeking, everyone that visits Ojai finds it easy to connect with the sense of serenity and peace that the valley instills. Even when packed with visitors, the valley is never crowded, and much of the surrounding landscape is protected wilderness. Heading up Route 33 to the north takes one through a seemingly endless array of open space, with hiking trails that can take you to hidden natural hot springs and lush waterfalls. The number of plant and animal species that thrive and co-exist here is surprising, and in fact the Ojai Valley and its surrounding mountains are one of the world's areas of greatest biodiversity. Within what is often referred to as the California biodiversity 'hot spot', the Ojai Valley region is among the most active and least disturbed. Conservation efforts here have preserved much of the natural beauty and allowed species to continue to thrive. It is no wonder then that the valley has become an agricultural Mecca. Things grow well here, and having a healthy local ecosystem helps. Ojai has drawn communities of farmers throughout recorded history, and continues to this day to be primarily agricultural space. From the Oak Grove people and the Chumash, to the Spanish missionaries, to the early California citrus farmers, Ojai has been home to a multitude of crops and the peoples that tended to them. The Mediterranean climate here is perfect for a wide range of agriculture, and happens to be particularly great for olives. The main olive grove on our ranch was planted in the mid-1800s, back in the era of the Spanish Missions, when there was a communal olive press in the valley. At that time the valley produced a good quantity of olive oil, and the trees thrived here. Their suitability to the Ojai climate is evident in the fact that the trees on our ranch survived for over a century before we came along and set up Ojai Olive Oil. Through droughts, wildfires, and storms, the olive trees persevered until we were able to care for them and once again mill their fruit into liquid gold. One of our award-winning extra virgin olive oils, the "Andalucian", comes predominantly from these beautiful old trees, a Lechin de Sevilla varietal that produces a wonderfully robust and peppery olive oil. Ojai Olive Oil is a third-generation family owned and operated farm, having been home to many members of the Asquith family over the years. While Mary Jane Asquith was the first to settle in Ojai, it was her son Ronald Harold Asquith who first began producing olive oil. It was his discovery of a stunning grove of 150 year old olive trees very close to the original family farm that sparked the idea. He and his wife Alice Asquith found that despite being left completely untended for nearly a century, the trees were in remarkably good shape, and still producing fruit. 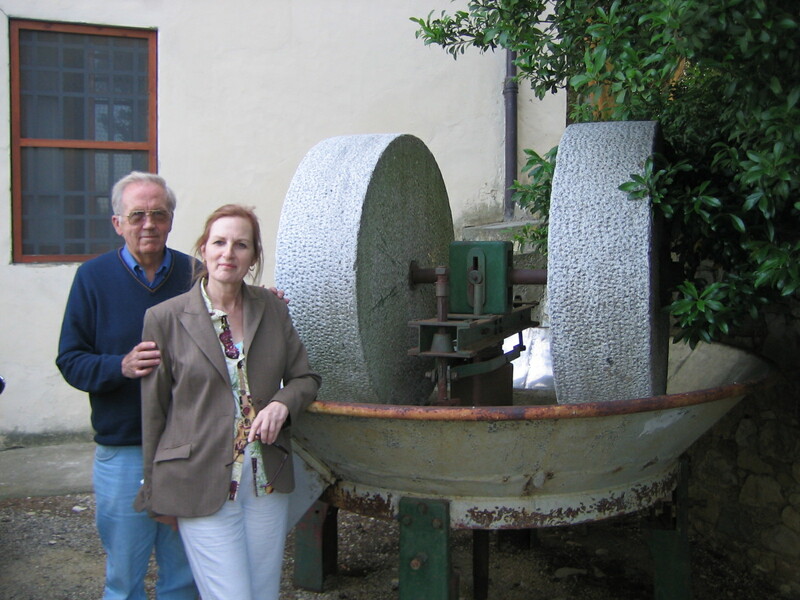 Ronald & Alice decided to purchase the land and began producing olive oil from those heritage trees the next year. After much research and testing, it was determined that the old trees were all a Spanish varietal called Lechin de Sevilla, and that they had been planted by a Danish family who had lived in the area back in the 1800s. 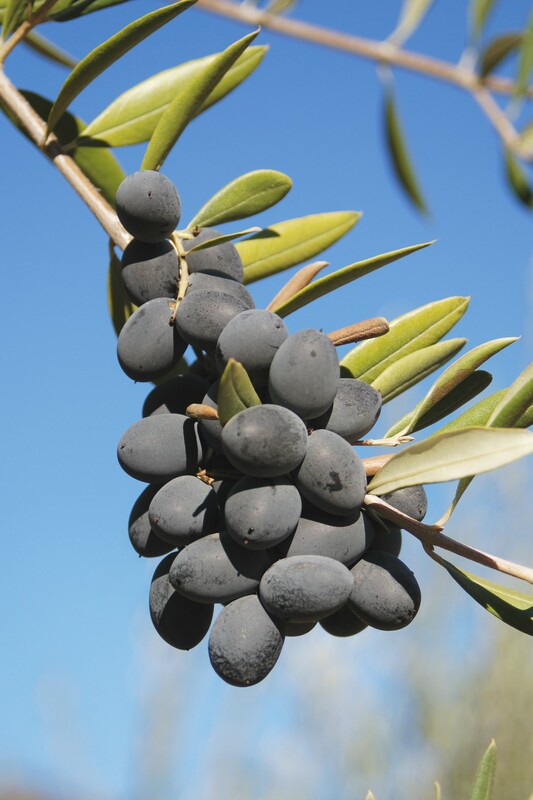 While their intentions aren’t known, it stands to reason that they had olive oil production in mind, as Lechin de Sevilla trees don’t produce good eating olives, but do produce wonderful olives for making olive oil. While the oil from these 150 year old heritage trees is excellent, it is also very strong. Spanish varietals are known for making very sharp and robust olive oils, and Lechin de Sevilla olives are one of the most intense. In order to balance that out, Ronald decided to plant groves of milder varietals. The first to go in was our grove of Columellas, a wonderful French varietal that produces a beautifully sweet and fruity oil. Next came the Italian groves, including Leccino, Pendolino, Frantoio & Maurino varietals. These mostly Tuscan olives tend to produce a nicely balanced oil that is both grassy and peppery while also being fruity and smooth. Over the years Ronald & Alice continued to add to the groves, planting primarily more Columellas and many Nocellara del Belice trees, a wonderful Sicilian varietal that produces a sweet and fruity oil. Many of the trees on our land here in Ojai were grown from cuttings taken in some of the oldest and most renowned olive groves of Europe. This practice is no longer safe today, due to risk of transmitting diseases or pests, but was at that point in time. The result is some truly unique trees here, which produce oils not easily found in this part of the world. Over nearly twenty years, Ronald & Alice tended to their groves of olive trees, and produced world class extra virgin olive oils for many to enjoy. All the while Ronald also taught his son Philip J.P. Asquith the details of the operation, so that eventually he could take over from his Dad. Philip was part of the annual harvest & milling team from the very beginning, and grew up with Ojai and farming as a big part of his life, so when the time came to take over operations, the transition was smooth. 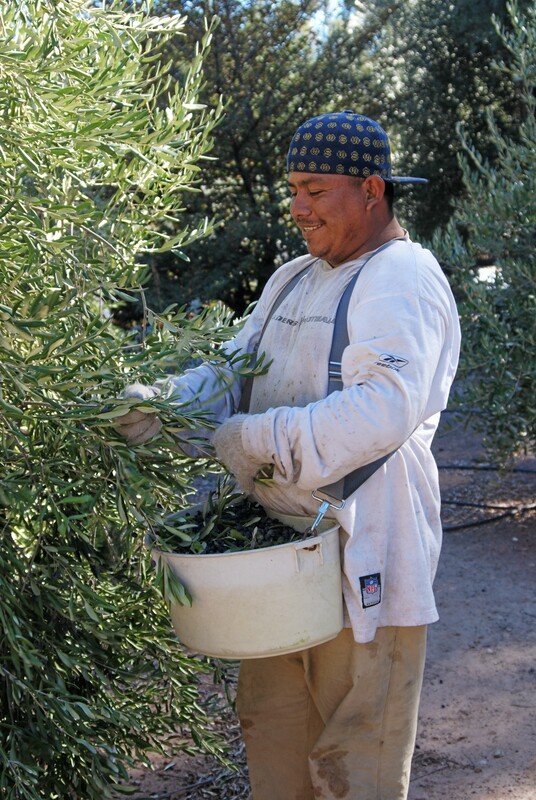 Today Philip manages Ojai Olive Oil much the way his farther did, and the family farm continues to grow. We plant more olive trees every year, and new programs to cooperatively farm olives on properties in the region have both expanded our production capacity and improved the sustainability of our operation. It is our hope that we can continue making the very best extra virgin olive oils possible for many generations to come. Harvest season is everyone’s favorite time of year at the farm. The groves spring to life as crews of pickers collect the ripe olives, and the early winter air around the olive mill is rich with the smell of sweet, fresh fruit being pressed. But long before we get to harvest our bounty and mill it into extra virgin olive oil, there are 12 months of careful tending to the land. Olive trees love Ojai's Mediterranean climate, and they thrive here, but there is still always work to be done. Each year begins with an intesnive pruning, to trim back the previous year's overgrowth and make space for the new season's olives. Olives will only form on new growth, so pruning properly is a key component of the process. Winter winds can also uproot trees that get too tall, and overgrown trees won't have as much energy to devote to fruit formation. By spring, the olive trees begin to flower, and we get our first glimpse of the season ahead. The spring bloom turns to baby olives in early summer, and by fall we can tell how many olives we'll be harvesting, and how well formed the fruit is that year. Harvest time for olives is always late fall-early winter. We generally pick from late September to late November. We pick all of our olives by hand, allowing us to be more selective in what fruit is being harvested. This also allows us to pick at the same rate that we process, keeping the time from tree to mill to an absolute minimum. This is critical, and is something that can only be done when farming on a modest scale. Huge operations make many sacrifices to improve profitability, most of which hurt the quality of the olive oil. At Ojai Olive Oil we do everything with making the very best possible olive oil as our only goal, regardless of difficulty or cost. 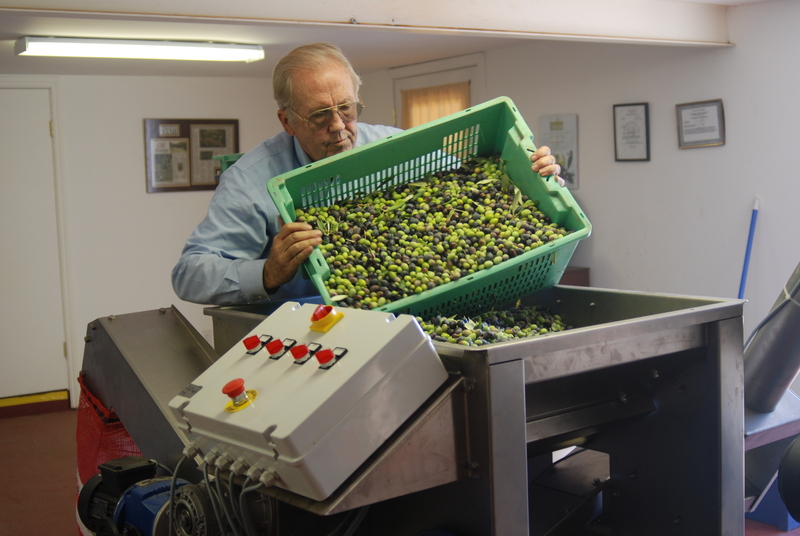 After being picked, the olives are carried over to the barn, and immediately poured into our olive mill. The mill's first step is a 'Hopper', that cleans off any loose debris like leaves and twigs from the olives. The olives are then taken into the 'Crusher', which pulverizes the fruit. The resulting dark purple paste is directed into large "Mixers", where it is slowly churned for about half an hour. This allows the droplets of oil to find each other and coalesce, while the crushed bits of fruit, skin and water cling to each other. The final phase is the oil separation, which is done by the "Decanter", a giant centrifuge. 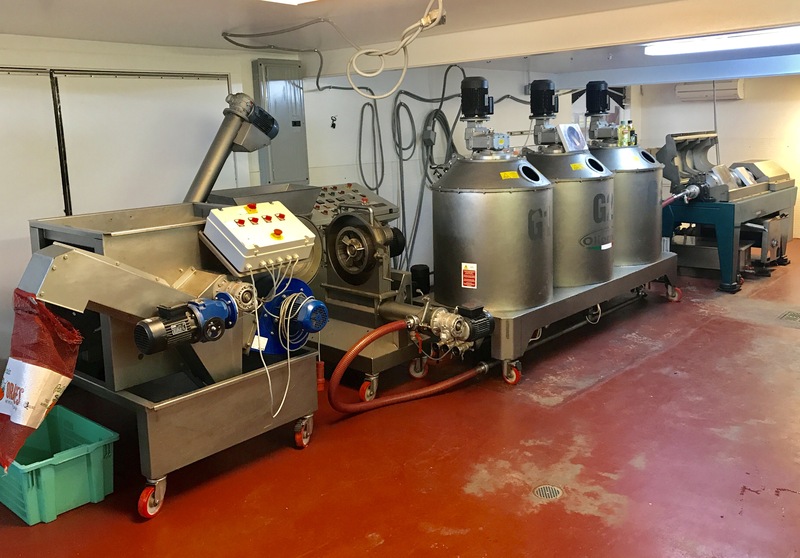 The contents of the mixers is rapidly spun, allowing the lighter olive oil to exit at one end, while all of the heavier elements of the paste exit the centrifuge at the other end. And voila!, we have the season's new extra virgin olive oil. The paste left over is transported into large compost piles, where we mix it with dozens of other elements to create a nutrient rich compost. That pile processes for nearly a year, after which time it is used to brew compost teas that become the key basis of our fertilization program. The best food for plants is derived from the decomposed matter of the plant itself. We facilitate that process on a mass scale, and supercharge it with a host of other beneficial microorganisms, micronutrients, and all of the core nutrients that olive trees need to be at their very best. This program has shown great results for us, and we consistently see much higher yields than anyone in our region, and excellently formed fruit. 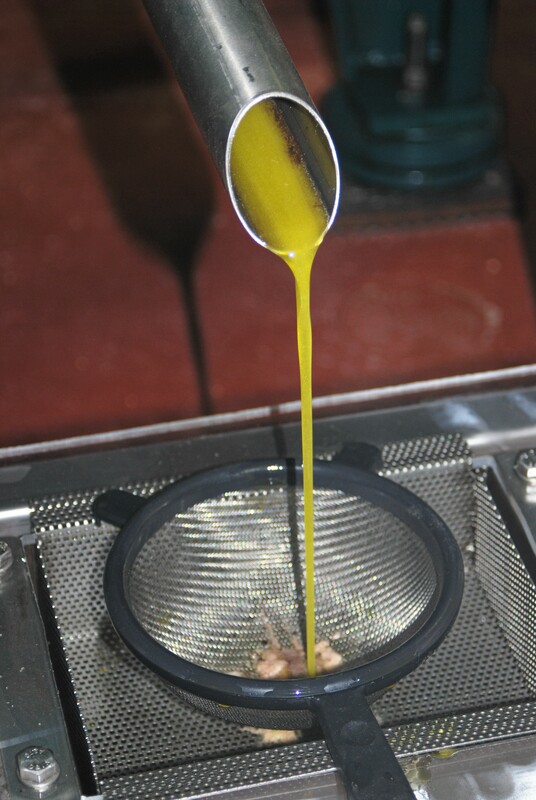 Before it is ready, the olive oil is decanted, to remove any remaining particles of fruit and skin, thereby increasing the shelf life and stability of the oil. If left in the oil, the little particles of fruit will degrade the oil. This process of decanting, or “racking”, is a way of passively filtering the oil to clean it up. Companies that claim to sell unfiltered oil are almost always using this process of several steps of decanting to do their filtering. Truly unfiltered olive oil, or the “Olio Nuovo” as it is called in Europe, is something one can only get for a few months right after the harvest, as it has a very short shelf life. Part of making a delicious product that we can be proud of is operating in harmony with the land that produces our olives and with our local community of people as well. The best olives come from healthy trees, and the healthiest trees live as part of a strong and vibrant ecosystem. Traditional agriculture isolates crops into artificial environments, where they are pumped full of chemical fertilizers and doused in pesticides and herbicides. Farming organically is a key first step, and beyond keeping toxic chemicals out of your body, it does wonders for improving the quality of the fruit and health of the trees. There is much more that can be done beyond this though, and each additional step adds benefits and strength to the ecosystem, and thereby to the olives and olive oil. Synergistic crops that help feed the fruiting trees, animals that help with fertilizing and pruning, composts and compost teas made of local plant life, beneficial insects that protect fruiting crops and promote pollination - there are a multitude of elements to a happy and sustainable ecosystem. Farming in a way that takes all of these elements into account is known as 'permaculture'. Permaculture is a branch of ecological design which develops sustainable and self-maintained agricultural systems modeled from natural ecosystems, and also has a strong element of positive involvement in one’s local community. The Asquith Ranch and Ojai Olive Oil are proud to be one of the few working examples of permaculture farming in southern California. Participating in our community is a big part of what we do, as is opening up our farm for others to see and enjoy. From our regular Tours & Tastings, now running seven days a week, to our Community Harvest days, we love having visitors. Take Care of the Earth: Instituting provisions for all life systems to continue and multiply. This is the first principle, because without a healthy earth, humans cannot flourish. The earth is our home and we must take care of it. Take Care of the People: Instituting provisions for people to access those resources necessary for their existence. Food, water, and other basic necessities are easier to produce from a healthy environment. With harmony comes abundance. Share the Surplus: Healthy natural systems use outputs from each element to nourish others. We humans can do the same. By governing our own needs, we can set resources aside to further the above principles and help others in need. Here at Ojai Olive Oil we are still in the early stages of building out our full vision of sustainable farming. We have been an all organic operation since our incpetion, and are proud to use no chemical fertilizers or chemical pesticides of any kind. We are also continually making strides to improve the ecosystem of our land, and our overall balance with our environment and community. Simple things like using our waste products as feeds, fuels, and fertilizers are continually being refined. We have also been putting a lot of resources into water management. Water is becoming a big concern for many farmers, but good soil management and rainwater catchment can do wonders for reducing irrigation needs. From simple things like adding your kitchen waste to compost piles, to huge projects like building off-grid power generation, there is lots one can do! Olives are clearly something we have a lot of, so by offering the olive oil we make to our community, we are able to support our ongoing efforts to develop our permaculture vision and support our family. We thank you for supporting this vision and for supporting your local farmers! And remember, since less than 5% of the olive oil consumed in the US is actually made in the US, and virtually all of that is made in California, even if you live in Maine or Florida, we are your local olive oil farmer. Now come over and visit us, taste some olive oils, and lounge in our groves. We promise you’ll enjoy yourself!